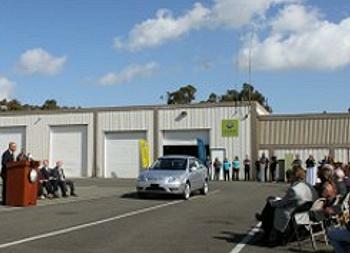 BENICIA, California, March 15, 2012 (ENS) – As employees cheered, the first all-electric Coda sedan for sale to a customer came rolling slowly off the final assembly line in Benicia on Monday. The 2012 Coda five-passenger car will be sold to a current reservation holder in California. “This car symbolizes our commitment to accelerating the adoption of EVs,” Heller told an audience that included Benicia Mayor Elizabeth Patterson, Solano County officials, plant workers and Coda executives. The electric car company is intentionally supporting the growth of green jobs in northern California as it conducts the final assembly at a facility located 30 miles from San Francisco. Initial assembly of the chassis and lithium-iron-phosphate battery pack is completed in China, under a joint venture arrangement with Chinese battery maker Lishen. The parts are shipped to Benicia where powertrain units and electrical components are assembled and installed and a vehicle safety and quality inspection is conducted. All research and design, marketing and sales happen at the company’s global headquarters in Los Angeles. The Coda will be soon available for purchase at California dealerships. The company plans to open a Coda Experience Center store and showroom, where consumers can learn more about electric vehicles, at the Stanford Shopping Center in Palo Alto this spring. As production increases, additional dealerships beyond the state will be announced. The Coda is rated at 88 miles per charge by the U.S. EPA. Depending on driving habits, the company says it can be driven up to 125 miles on a single charge. The power is supplied by a lithium-iron-phosphate (LiFePO4) battery pack with an industry-leading 10-year, 100,000-mile limited battery warranty. A 6.6kW onboard charging capability provides a full charge in about six hours on a 220V plug. When plugged in or driving, the Coda sedan’s active thermal management system will heat or cool the battery to maintain battery integrity and consistent driving range in extreme temperatures.